The Houston Rockets are taking a leisurely cruise into the station to end the regular season, and this effortless drubbing of the New Orleans Pelicans is just another pit stop on the way to the playoffs. Even without Chris Paul and Luc Richard Mbah a Moute, the Rockets were able to build a 20-point lead and hold onto it for most of the game. 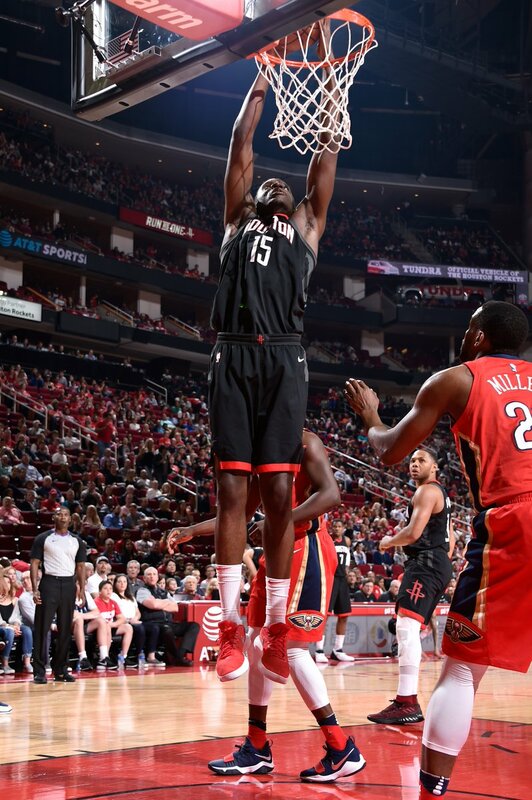 It was never close, Clint Capela looked dominant, and Ryan Anderson dunked. Mission accomplished. Notably, this game marks 59 wins for the Rockets this season, the most the franchise has ever won. While head coach Mike D'antonio said after the game that the players don't care, it remains a worthwhile achievement. They've won the division, secured the most wins ever in team history, and are locked into a 2-seed at very worst and April hasn't even started. This is the best Rockets team ever, no matter how you slice it. Even with questions about the playoffs which cannot be answered yet, this has been the best regular season the Rockets have ever had, and it's been a sight to behold. Harden has gotten to the point where a 27 point, 24 shot, 6 rebound and 8 assist (and 9 turnover) night is yawn inducing. He's made the extraordinary into the ordinary and he's going to win MVP for it. The only thing, the most important thing left on the James Harden checklist is to win a championship. We just have to wade through these nearly meaningless games to make it to the playoffs first. The hero of the night was Clint Capela, who has come into his own on both sides of the floor. He scored 18 points on 9-12 shooting, grabbed 16 board, tallied 6 blocks and added 3 steals to the mix just to gild the lily. This was one of the best games of his entire career, and he did much of it standing opposite Anthony Davis. Capela cannot be underestimated either as a key element of the team or as an incredible home-grown talent. And, of course, Ryan Anderson dunked. That's always worth popping a bottle of something for.